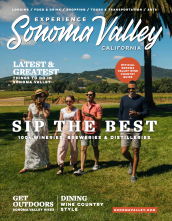 It can be a bit confusing to find “Sonoma Valley” — not that the picturesque valley tucked between two mountain ranges about 45 miles north of San Francisco is hiding from the world. The roughly 17-mile long valley is next to Napa Valley, and is one of the main attractions in Sonoma County. But defining the where is a lot easier than nailing down the what. Is it the birthplace of modern California and the cradle of “wine country” cuisine? Or is it a place for urban chic, starry-eyed bohemians, and farmers with mud falling off their flatbed trucks? It’s all of those — and more. Sonoma Valley is taking selfies in the giant sunset-orange Adirondack chair at Cornerstone Sonoma and next to the statue of Gen. Vallejo sitting on a park bench in Sonoma Plaza. Sonoma Valley is marveling at the 2,000-year-old, 14-foot-wide Grandmother Tree in Jack London State Historic Park. It’s a three-block-long Fourth of July parade that lasts two hours, and a serene walk through neat rows of grapevines that seem to curl over the hills and into the sky. Feel the cool breezes from San Pablo Bay as you gaze out over the gently rolling hills and the flat plain that form the southern end of Sonoma Valley. Life slows down in these wide-open spaces, and there’s plenty of time to explore, to taste fine wine and gourmet olive oils, and to stroll through vineyards, boutique shops, and designer gardens. Vineyards here specialize in cool-weather varietals like Pinot Noir and Chardonnay as well as sparkling wines made from these grapes. Sharing a name with the neighboring valley and the entire county, the town of Sonoma is a quaint wine-country community known for the eight-acre Sonoma Plaza. Relax at a picnic table under a shady tree with a picnic, take a leisurely stroll along the charming streets, discovering boutiques, restaurants, and wine tasting rooms. You’ll find old adobe buildings and other historic sites almost everywhere you turn, and don’t forget to spend a moment in the quiet serenity of the last Spanish/Mexican mission built in California. You can’t miss the brightly colored building façades — including a giant, multi-colored metal chicken outside a local grocery store — and the cool, Mission-style lines of the Fairmont Sonoma Mission Inn, a historic luxury resort. Both are highlights of this dynamic area, consisting of four adjacent communities and nicknamed for its underground hot springs. Variety and diversity are the watchwords here, with family-owned eateries and businesses, boutique shops, and wine-country fab thrift shops. “Quaint” will undoubtedly come to mind as you explore this wine country village, with its western chic vibe. Dine on delicious farm-to-table cuisine and taste wines crafted from grapes grown in the surrounding vineyards. Hike incredibly scenic trails and discover the life and times of famed author Jack London in the hillside state park bearing his name, and then wander through acres of beautiful Asian plants in botanical gardens east of town. Bite into a just-picked strawberry at the strawberry patch, and smile at the incredible collection of colorful metal critters outside the feed store. Tucked into northern Sonoma Valley’s vineyards, rolling hills, and wide meadows, this tight-knit community offers a variety of delightful experiences, from wine tasting to hiking and camping at the nearby state park, or relaxing in Mediterranean-style luxury at Kenwood Inn & Spa. Heading northwest, Sonoma Valley ends with a rise in the land that marks the boundary with the Santa Rosa plain and the watershed that feeds not into the San Pablo Bay but rather into the Pacific Ocean. The communities of Santa Rosa, Windsor and Healdsburg are to the north, while Petaluma lies to the southwest and the beaches of Bodega Bay are to the west. All of these areas provide more adventures when you have finished exploring Sonoma Valley.